Lady Gaga’s video for her song “G.U.Y.” has a lot of viewers asking “What the heck did I just watch?” While at first, the video may appear to be a bunch of nonsensical and random imagery, as usual, there is meaning behind the images. And, as usual, it is in line with the occult elite’s philosophy and mythology. In this article, we’ll look at the esoteric meaning of Gaga’s video “G.U.Y.”. Lady Gaga has been around for awhile now (my first article about her was almost five years ago) and, although many have tired of her attention-seeking stunts, she still maintains a solid, and dedicated, fan base. Her video entitled G.U.Y. got her fans excited, but reading comments on YouTube, most of them openly don’t get what is happening in the seven-minute production. And who can blame them? There are men in suits fighting with bows and arrows, there are the Real Housewives of Hollywood playing instruments, there’s Michael Jackson being resuscitated, and there are Legos. This headache-inducing video that spans several songs nevertheless contains a linear and (somewhat) logical storyline and meaning. To truly understand it, however, one must be aware of the mythology invoked in Gaga’s video (and her entire album) and the occult meaning behind it. Once these important connections are made, the rest begins to make a little more sense. As is the case with most Lady Gaga videos, there are a few obvious pop culture references – which are profusely commented on by music reviewers – but the underlying, fundamental story goes unnoticed, or at least unmentioned. Nonetheless, this story is steeped in the mythology that is upheld by the occult elite. The sexually charged video premiered on NBC’s show Dateline on March 22, right before a report about two teenage girls who were abducted and abused. Why did the video premiere on Dateline, of all shows – and why right before this kind of report? Maybe for the same reason, Gaga had a “vomit artist” vomit on her during her live performances at the recent SXSW: Her work often ends up promoting what she appears to be denouncing. In the case of the “vomit artist”, under the guise of “being yourself” or whatever, she’s actually glamorizing bulimia and all-around self-destruction. Millie Brown sticks her finger down her throat and vomit a green substance all over Gaga. Is this art or another way to mess up the minds of young girls? On this fitting note, let’s look at Gaga’s video G.U.Y. The first scene of the video is quite enigmatic, clearly announcing that it is a Gaga flick, where the line between profound artistry and random nonsense is always difficult to define. It begins with a bunch of men in suits fighting in a field, grabbing at dollar bills. Then we see Lady Gaga on the ground with wings on her back. Gaga is pierced by an arrow that was apparently shot by one of the suit guys who is holding a bow. Why was Gaga shot down? Do the men represent music industry scumbags? Maybe. One thing is for sure: Gaga was an angel flying in the sky, minding her own business, then was shot down, becoming a fallen angel. And who is the most important fallen angel in History? Lucifer, of course. 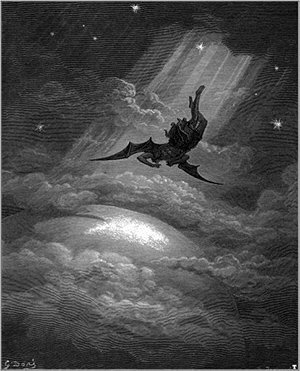 The fall of Lucifer as depicted in John Milton’s “Paradise Lost”. While one could argue that Gaga playing the role of a fallen angel might not inherently imply that she’s referring to Lucifer, a look at the symbolism later in the video strongly points towards it. Indeed, much of the video plays on the esoteric associations between Lucifer, Venus, and Ishtar, which I will cover a little further down. Back in the video, a wounded Lucifer-Gaga gets up and walks towards civilization, ending up in front of the Hearst Castle. The location of the video is significant for several reasons. The castle was built by newspaper tycoon William Randolph Hearst, one of the most powerful and richest men in American history and the inspiration behind the film Citizen Kane. The mansion used to be a popular meeting point for Hollywood stars and the political elite. Like Gaga’s work, the Hearst Castle combined entertainment and the occult elite. Unsurprisingly, William Randolph Hearst was himself an important figure of the occult elite. The newspaper tycoon William Randolph Hearst, a high-degree Illuminati initiate, funded his early “crusades”. The Hearst mansion in California is furnished with hundreds of ancient Egyptian and other Near and Middle Eastern artefacts. Most of them are original and were shipped to the United States by Hearst at enormous expense. It was Hearst’s support for Franklin Delano Roosevelt that won “FDR” the Democratic nomination and the presidency in 1933. Roosevelt, the wartime president, was one of the great Illuminati frontmen of the 20th century (see …And The Truth Shall Set You Free). The Rockefellers, Witneys, and Vanderbilts, all Illuminati bloodline families, have funded other Graham “crusades”. Given Hearst’s connection to the elite, it is of course not surprising that the Hearst castle was built with the occult elite’s mythology in mind – which is, in turn, the mythology Lady Gaga is always attempting to sell to the youth. Lucifer-Gaga arrives in front of the Hearst Castle and is greeted by hooded men. Of course, the two guardians of this Castle of the Occult Elite won’t let Lucifer die like this. They get her inside the castle so she can get a ritual fit for a fallen angel. When Gaga enters the castle, the song Venus begins. Gaga’s entire album is centered around multiple representations of Venus (in the video for Applause, she is dressed as Venus as depicted in Botticelli’s painting The Birth of Venus). In G.U.Y, the theme of Venus is still central in numerous symbolic ways, including its esoteric association with Lucifer. Since ancient times, the planet Venus has been known as the Morning Star and the Evening Star. The Romans designated the morning aspect of Venus as Lucifer, meaning “light bringer”. In the Bible, Lucifer, the angel cast out of the heavens, is also referred to as the morning star. The association between Lucifer and Venus remains of the utmost importance in modern occultism. In the modern occultism of Madeline Montalban, Lucifer’s identification as the Morning Star (Venus) equates him with Lumiel, whom she regarded as the Archangel of Light, and among Satanists he is seen as the “Torch of Baphomet” and Azazel. However, in lesser-known Kabbalah lore, Lumiel was also described as an angel of the earth, though usually Sandalphon and Uriel are the only Archangels associated with the element of earth. In any case, Lumiel’s precise identity has always been controversial and many people, who tried to discover his true nature, eventually came to refer Lumiel as a “dark angel”. Therefore, Gaga playing the role of a fallen angel while a song named Venus plays in the background is far from being random. While the word Venus is repeated throughout the song, another important symbol appears on screen. While a dying Lucifer-Gaga is being carried by hooded men, the path to her “burial site” is paved with the symbol of the star of Ishtar. The eight-pointed Star of Ishtar has been mentioned several times on this site as it is an important symbol in occult Mysteries. Ishtar is the Babylonian goddess of fertility, love, war, and sexuality and is considered to be the “divine personification of the planet Venus”. This ancient Semitic symbol, therefore, completes the esoteric representation of the concept of Lucifer-Venus-Ishtar, a profound, mysterious and extremely important concept in the Mysteries of occult secret societies. Why was the symbol of the star of Ishtar embedded on the floor of the Hearst Castle? As stated above, William Randolph Hearst was a 33rd degree Freemason and an Illuminatus who was highly knowledgeable in occult symbolism. The symbol of the star of Ishtar often appears on the floor of “occult-themed” buildings (see my articles on the Los Angeles Central Library and the Manitoba Legislative Building). 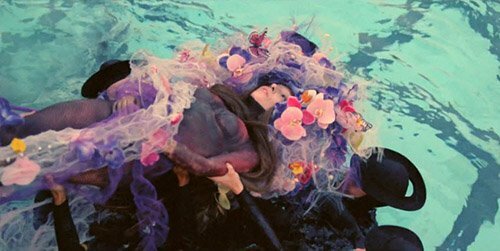 In this symbolically-charged setting, Gaga is taken to the castle’s Neptune pool where a death ritual takes place. On Gaga is placed an arrangement of flowers and … Monarch butterflies. Is this a way of saying that Gaga’s death and rebirth is done through Monarch Programming? After the death ritual, Gaga is reborn and greets Himeros, the god of sexual desire. Her hair is now platinum blonde and, from being an angel, Gaga is now all about sexuality. Does this represent the creation of the persona of Lady Gaga by the occult elite music business? After the rebirth, everything in the video turns to white and things become highly sexual. While Gaga’s rebirth is happening the Real Housewives of Beverly Hills make an appearance playing the role of the muses, daughters of Zeus. The fact that they clearly do not know how to play these instruments and that there’s obviously no harp or cello in the actual song add to the fact that this is all about being fake, phony and plastic. In this scene, Gaga has her head on a work created by the “lego artist” Nathan Sawaya. What a great way to show how Gaga’s persona is artificially built and completely empty inside. Himeros was an Erotes – a collective of winged gods associated with love and lust. Here, Gaga’s dancers play the role of various Erotes. Here Gaga holds a lego apple with a bite taken from it which is a reference to the apple of the Garden of Eden. The apple was given by Lucifer and gave humans knowledge of good and evil. In occult Mysteries, Lucifer is viewed as a “savior” who gave humans the knowledge to become gods themselves. While Gaga’s rebirth seems to be all about love, she is also brewing a revenge master plan … a very strange and disturbing master plan that involves a rather unholy science. Gaga enters a room containing four tombs connected to a computer. From them emerge Jesus Christ, Gandhi, and Michael Jackson. Nurses then proceed to draw blood from each zombie, including Jesus, which is kind of not respectful. There are several things that do not make sense in this scene. One of them is: Why is Jesus even there? Isn’t the whole point of his story is that he resurrected and ascended to heaven? Why is he even in a tomb? And why does Lady Gaga have access to it? I mean, according to Christianity, Jesus was not some “guy”. Anyhow, each one of these three figures is meant to represent a trait that should be present in Gaga’s vision of the ultimate “guy”. Interesting fact: All of these figures were killed by the “powers that be” in their time, after which their message and “aura” was used for all kinds of foul agendas. Also, you might have noticed that there are four tombs, but only three men are shown. 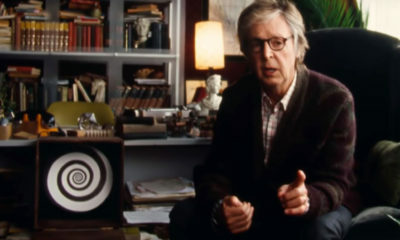 According to the director (and the credits), the missing figure was John Lennon, but Gaga decided to remove him from the video. Interesting fact: Lennon was also assassinated (and most likely by an MK stooge). The blood is collected by nurses wearing stylized horns. Horns equal playing God and that’s exactly what the horned nurses do. The horned nurses begin cloning a bunch of dudes wearing black suits. While the cloning is happening in the background, Gaga and friends dance very sexily. Playing God and cloning people using the blood of dead people is indeed very hot. If I saw Jesus-cloning going on, I’d also want to take off my shirt and dance feverishly. Once Gaga’s army of clones (strange way to represent her fans) is complete, she goes to the offices of the suited men who shot her down in the beginning of the video. From white, everything now switches to black. Gaga wears crow wings on her head. In Ancient Greece and other civilizations, crows were considered to be omens of death. “Look at me, I’m a clone AND a douchebag.” This what Lady Gaga-sponsored science produces. The video ends with an upsetting scene: Thousands of cloned “guys” mindlessly leaving the Hearst Castle to annoy the world. This is how the elite sees consumers of popular culture: a bunch of brainless clones doing as they’re told. The clones emerge from the Hearst Castle (an occult elite hotspot), indicating that these clones are made the occult elite’s way. To sum up this video, Gaga begins as a fallen angel who got shot down from the heavens by greedy businessmen. She is then “initiated” inside a Hollywood-occult-elite castle where she is reborn as a lustful blonde goddess. She then quickly uses her powers to create an army of clones using blood from Jesus Christ, Gandhi and Michael Jackson. Yup. G.U.Y. is profoundly steeped in the elite’s symbolism and mythology. Shot at the Hearst Castle, a mansion built by a high-level Illuminatus, G.U.Y. tells viewers where the messages communicated in popular culture emerge from. The same way William Randolph Hearst manipulated public opinion with his brand of “yellow journalism”, today’s culture affects public opinion through pop stars. The video starts with symbolism that is strongly Luciferian – and Luciferianism is all about becoming gods. Then Gaga actually becomes a god and starts giving life to a new race of clones. Of course, all of those messages are coated with a large amount of “love” and sexiness to make them easy to digest for today’s average viewer. In short, G.U.Y. is a typical Lady Gaga video. And like all typical Lady Gaga videos, while the story appears to be uplifting and “empowering” (man, I hate that word), its factory-created, mindless clones and occult Illuminati symbolism actually glorify elite repression and mass mind control. … Kind of like having someone vomit on you to denounce bulimia. Exactly, although noone seems to get it …. Thanks for your analysis. So what is left for people who have no money and no access to the codes of the elite ? A truth that makes everyone wants to throw up if they want to see it as it is and …. Reinvent them and stop believing in fairytales ! These people have lied to you. Suggest them another truth, your truth. I strongly believe life is not always only about fate, but what you make of it, so is society. Anybody agrees. If not why ? Are you just trying to lie to yourselves because all we do matters. If bad and good exist, our acts can be good or bad as well. Not quite what everyone told you, eh? Did it make people more religious or more human? Just questions and no answer, but, …. It just answers to another question : it was on purpose, and probably not because of her. Anyone gets it ? I don't think many people will, but it makes me feel good to write. Peace to you, this is not about being mean but realistic. To those who have never sinned, …. Yes, they can judge me, I guess. Because I am just trying to be honest and don't like liars, so judge them as well. I am happy : good job, wonderful boyfriend. And wish everyone the best. what do you know about the acts of MK'd celebs, Trevor. Seems like an simple task. This video is about satan going full force at this world and ending up on top. Remember he wants to be like or better than God, that's why he got kicked out of heaven. He doesn't want people to see him as a fallen angel but as a beautiful God that rules over all this world.. That's probably what the death if the fallen angel and rebirth if the pure white goddess like Lady gaga represents? Satan's goal is to set up his kingdom here on earth and he will "try" and do so with the help of his demons (1/3 of the angels fell from heaven with him) who are the men in black and shows like "the real Houseives" and other mindless shows that do nothing but throw a tranquilizer in us all… These type of shows keep us asleep and not awake thinking about the real war that is going on between Jesus and satan behind the scenes.. I recommend the book, "The Great Contoversy" by Ellen White.. It tells you what is really going on behind the scenes! THEY believe in what they are doing and this is why they are dangerous. I totally agree, it is difficult to convince people if you are not convinced yourself. It works both ways, they were conditioned into loathing what deosn't fit in their vision. However, they are responsible for acccepting this manipulation, mostly for their intellectual comfort. So are we if we accept being conditioned into something we do not want. But the naked truth is hard to bear, so people repress it into a subconscious level. Well this is music to my ears! after the sacrifice of the deceiver = our own ego and pride. "This is how the elite sees consumers of popular culture: a bunch of brainless clones doing as they’re told. " Ironically, the elite is not wrong on this point. The "consumers of popular culture," i.e., "We the Sheeple," are "a bunch of brainless clones doing as they're told." True, but you could also say the same about the Lucifer-worshiping elitists, who are mindlessly following whatever their dark lord (a.k.a. the guy at the top of the pyramid) says to do…and it will be to their ultimate destruction. If they don't qualify as sheeple, I don't know who does…. I really agree with you ! It is up to us not to be a bunch of brainless clones doing as we’re told. They sure know what they are doing and the elite is probably not ready to share its wealth with the crowd so easily. Have you ever noticed that part where Lady Gaga is in yellow. Most likely it represents sulfur (since sulfur is yellow). Note how you see her in Yellow right before and after Jesus and Ghandi are shown. Assuming she is a shape-shifter she is stating that she is currently in solid form. However, the use of sulfur is rampant in the bible and is associated with demons and demon possession. Perhaps people should read The Bible from a (bio) technological viewpoint. The interesting part of the video is where people with actual talent, intelligence, and singular vision are captured, harvested, and their genetic code is used to reproduce vapid clones. These clones have none of the genuine traits that the visionaries had, only the genetic basis; then that progeny is sent out into the world, and celebrated as 'unique' and 'special'. Nothing better could capture GaGa's and the mass entertainment industry's modus operandi. I feel that that scene properly summarized her careerist motivation behind stealing other people's ideas, work, and creativity, while passing it off as her own. The occult underpinnings just make the theft-transformation more sinister. I have read in lots of other sites that the clonning part is super real and actually that Lady Gaga is herself a clone. If you think about it, clonning has been forced into our faces for around 20 years in the movies. It makes total sense that it is real and happening already. I've read that most of the top celebrities, being that actors or singers, are clones, and that Lady Gaga actually died in 2004. I don't know you and I do not mean to judge you in any way but your comment scares me. People are actually ready to believe in everything that they hear on the Internet, which is not often, and that is the least you can say, true or accurate. I will not comment on the facts that you are stating because I consider you to be a clever person. This is how they are using you on every level. Think about it please, thank you. My goodness. By now I just shouldn't be surprised! who s the second women with the dog in the car that appears before on the video? well she uses jesus ghandi and mj blood to create clones, because this tree are the ones who creates more clones in our society than anyone else, they make millions of people think in the same way, follow a certain "true"
She wasn't denouncing bulimia or anything like it. That performance (and the song itself) are about her being raped by the elite. Literally. The vomit is suppose to represent the ugliness of it. Marry The Night, however, has eating disorder glorifying scenes. She is clearly denouncing the attitude of the elite. They actually spoil the mind of the youngest and encourage eating disorders by showing models that are more and more skinny. She chose to turn it into something ridiculous on purpose, surely not to submit but to criticize. There is lots of ugliness and hypocrisy in our society, and she just doesn't accept it. She thus created a character that is all fame and glamour because she knows it is the only way to make her point. Now it may be shocking for a lot of people, but there is no other way to be heard, unfortunately. I hope this can change. The video is a distraction from the song, which is a swipe at the men who lead straight lives but are in the closet. Thank goodness someone is dealing with it. You people here have no idea how many married men with kids are cheating in their wives or girlfriends with other men. Anecdotally, try almost 50%. I never listened to it that way. I'll have to check the song out again. She's clearly showing who the illuminati is wanting to sacrifice next. Same as she did to warn her Lina Morgana was gonna be sacrificed. If you can't guess who's she's representing in this video, come on! If one sees religion as quint mythical fiction, all of this hue and cry over this comes across as profoundly silly.